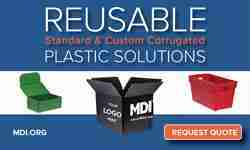 IFCO SYSTEMS has opened its newest reusable plastic container (RPC) Service Center in Fresno, California. The 200,000 square foot facility is equipped to wash, sanitize, and dry more than 95,000 RPCs per day, and ship and receive approximately 120 truckloads of RPCs for IFCO’s grocery retail partners and grower shipper customers weekly. IFCO’s Fresno service center currently has more than 80 employees and is designed to allow expansion as for IFCO RPCs continues to grow. “We are pleased to open our most advanced facility to date in Fresno, complete with the latest food safety systems and sustainable operations. Our growth during the past few years has demanded the expansion of our service center network so our grower and retailer partners have all the safe and clean RPCs they need to serve their customers,” said Dan Walsh, President of IFCO North America. The new facility is IFCO’s sixth U.S. service center, extending the company’s network in North America in support of the continued expansion of RPC use by leading grocery retailers throughout the U.S. and Canada. 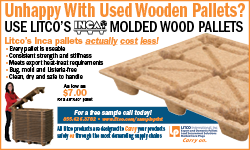 IFCO’s other service centers are located in San Antonio, TX; Rancho Cucamonga, CA; Atlanta; Portland, OR and Chicago. IFCO owns and operates 49 service centers in 19 countries. All IFCO service centers adhere to the company’s strict global standards for processes and equipment, including the industry’s highest food safety and quality assurance protocols, and employ a variety of measures to reduce environmental impact. For more information and a video tour of IFCO’s RPC service centers and wash process, please visit www.rpcresource.com. 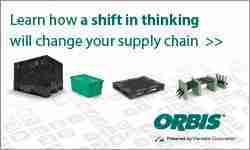 Goplasticpallets.com has launched a new perforated, rigid pallet box in the UK – the GoBox 1210 BBE – which is ideal for the storage and transportation of fresh produce and other food ingredients. It is well-known that freshly harvested fruit and vegetables start to deteriorate immediately. The GoBox 1210 BBE grocery box, however, has a perforated base and side walls which aid air circulation, product cooling and ventilation. The box’s rigid structure also offers ultimate strength and protection, helping preserve the quality of fresh produce for longer. The ability to withstand extreme hot and cold conditions means that the GoBox 1210 BBE grocery box is suitable for use in hot and humid environments as well as cold storage in temperatures as low as -40o C.
Jim Hardisty, Managing Director of Goplasticpallets.com, said: “Growers, wholesalers and supermarkets can achieve significant cost and environmental savings by switching from single-use corrugated packaging, to returnable plastic containers. Manufactured from virgin, fully recyclable high density polyethylene, the 1200 mm (L) x 1000 mm (W) x 760 mm (H) grocery box weighs 37.5 kg and offers an internal storage capacity of 670 litres. Supported on three skids, each box can tolerate loads of up to 500 kg and can be stacked up to nine boxes high, offering a total stacking load of 4500 kg. Fully resistant to UV and infrared rays and 100 per cent water resistant, the GoBox 1210 BBE grocery box is suitable for storage outside when empty, and can be easily steam cleaned manually or with an automated cleaning system. The GoBox 1210 BBE grocery box is available in either grey or blue.